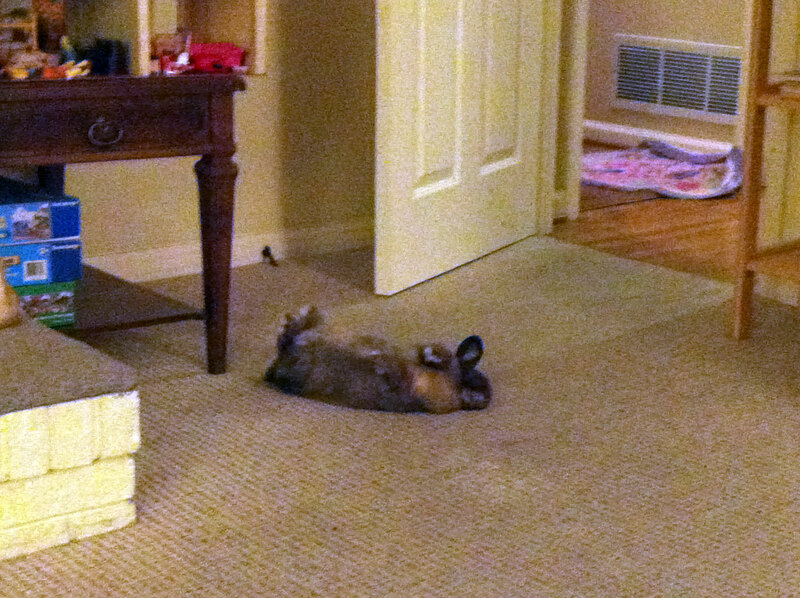 Jaggy the bunny was sound asleep, but if she was trying to play dead then she did an emmy award winning performance for a good 30 seconds … enough to scare me into thinking maybe she was dead! With Kristine taking the kids early in the week up to a big family Thanksgiving gettogether in northern Indiana, I stayed home to finish teaching my classes for the week and then take care of Jaggy the bunny. What a hoot the last day turned out to be as Jaggy ended up laying over on her back with all four paws and one ear in the air — sound asleep! I panicked shortly after taking this picture thinking that maybe she had choked on something so I ran over to check on her and ended up scaring her badly as she righted herself and bolted for the door before stopping and coming back. My classes ended on Tuesday for the week so I had Wednesday, Thursday, Friday, Saturday, and Sunday to kick-start base training for the upcoming season. I ended up doing a ton of climbing with more than 10,000 feet of climbing each day for over 50,000 feet of climbing in just 5 days. The weather was absolutely fantastic all five days with shorts / short sleeve weather on Wednesday, Thursday, and Friday … followed by cold but clear weather Saturday and Sunday. Wednesday’s ride was mostly in Mountain brook – wandering over to Irondale to scope out the Karl Daly climb and get a video for this week’s Strava Shootout climb. 58.1 miles and 10,052 feet of climbing. Thursday’s ride was early Thanksgiving morning, and I put in my KOM attempt on the shootout climb early in the ride on my way over to Red Mountain to climb to some of the 1200 ft spots on the mountain — what is becoming a Thanksgiving tradition (see 2012 and 2011). 75.4 miles and 10,534 feet of climbing. For Friday, I wanted to do 10,000 feet of climbing just on Shades Mountain climbs in Hoover, Vestavia, and a little bit of Homewood. 63.6 miles and 10,394 feet of climbing. Saturday was a Thanksgiving weekend special edition of BBL. We had a great turnout despite temps below freezing to start the ride. I picked out a route to take us up Pine Mountain near Springville, but otherwise tried to stay to flatter valley roads getting us there. This meant I had to add on about 20 miles to get the climbing total up to 10,000 feet. 99.1 miles and 10,253 feet of climbing. Finally, today, I was happy to have Kristine and the kids home so I ended up trying to hit 10,000 feet of climbing in as short as possible time and distance. I tied a distance record but fell a few minutes short of a time record … distance to 10,000 feet 50.1 miles, time to 10,000 feet 3 hours 51 minutes. 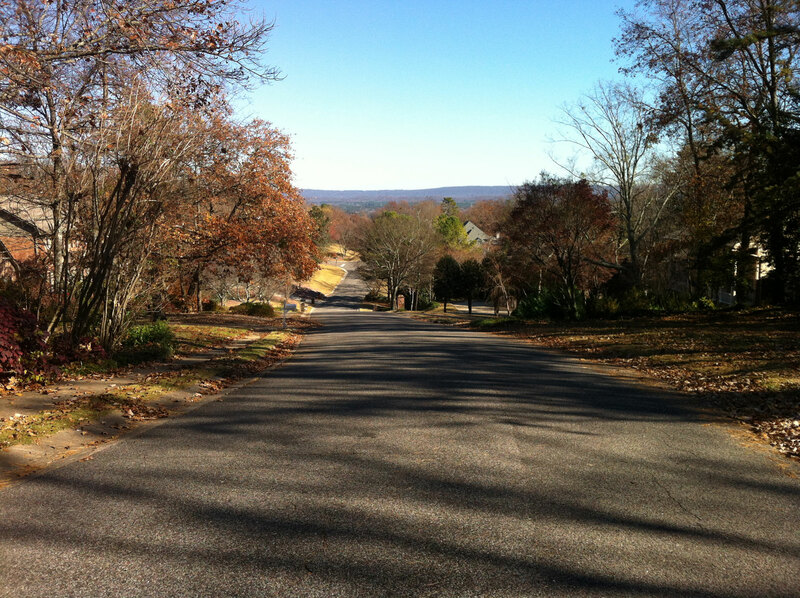 Total ride 55.4 miles and 10,398 feet of climbing – most of this in Mountain Brook. So close!!! The elusive 1:2 climbing ratio for 10,000 feet … haven’t quite hit it yet! This is the second time I’ve come really close. I kept taking screen captures of 50.0 as I was climbing up Vestavia Dr knowing that any second it would tick over to 50.1 miles. Sure enough, I missed it by 10 feet. Max speeds … I photoshopped two separate screenshots together to get all 8 laps on one screen. Look at the decimal place on the max speeds … I would guess the probability of the decimal places patterning out like this is really low, but here is an existence proof that even low probability things can happen! I was robbed on the 49.1 on the first time down ride the bowl … I know I was going faster but I hit a bump at the high speed point and I’m wondering if it caused the wheel sensor to miss the magnet for 1 revolution. All told this five day block of training covered 351.6 miles and 51,631 feet of climbing. Great start to my training for 2013 … a bit of recovery early this week before some long slow rides later in the week. This entry was posted in Training on November 25, 2012 by kartoone.